Foles, who guided Philadelphia to a Super Bowl championship last season, has been sidelined with neck and back spasms that caused him to miss Thursday's preseason opener against the Pittsburgh Steelers. Eagles coach Doug Pederson told reporters that Foles would practice on a limited basis, saying he will "do a little bit today," per Philly.com. 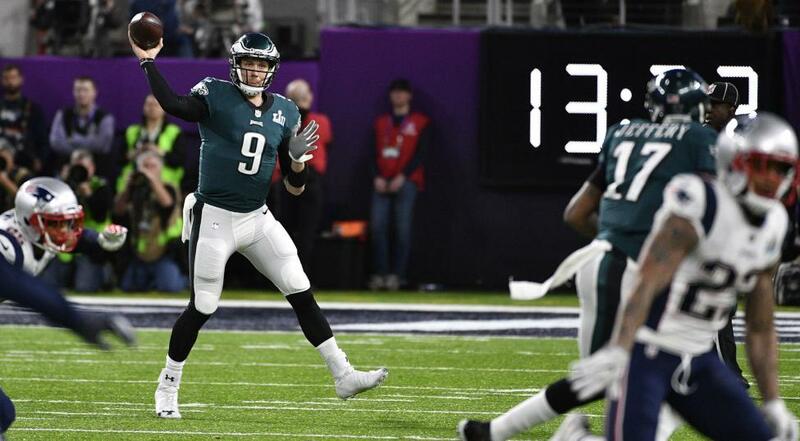 Foles missed three practice sessions because of the ailment but the reigning Super Bowl Most Valuable Player downplayed the issue during the week. "It's going to be fine," Foles said. "It's not a big deal. We're just being smart." [post_ads]With Carson Wentz continuing his recovery from a knee injury, third-string quarterback Nate Sudfeld and Joe Callahan took all the snaps in the 31-14 loss to the Steelers. --Pittsburgh Steelers wide receiver Antonio Brown returned to practice after missing recent practices and the team's first preseason game with an undisclosed injury. Pittsburgh coach Mike Tomlin said earlier in the week that Brown would return to practice after missing the preseason opener against the Philadelphia Eagles. Brown reportedly looked to be fine during individual drills. The Steelers may hold out Brown on Friday when they face the Green Bay Packers at Lambeau Field. Brown should be at full health by the time the preseason comes to an end. --The Indianapolis Colts announced they have released veteran safety Shamarko Thomas, who became the first player ejected for a helmet-to-helmet hit under the NFL's new rule in the preseason opener Thursday. Thomas was ejected late in the fourth quarter in the game against the Seattle Seahawks for a vicious helmet-to-helmet hit on receiver David Moore. Under the amended rules, any player who lowers his helmet to establish a linear body posture prior to initiating and making contact with the helmet and is unobstructed in his path to the opponent is subject to ejection. "That was very disappointing. I'm very disappointed," Reich said after the game in regard to Thomas' hit. "We don't teach that. That was a good call, that was the appropriate call, he should have been ejected. ... That could have been avoided, should have been avoided, and the referees did the right thing." Thomas, 27, came to the Colts after stints with the Pittsburgh Steelers and Buffalo Bills. The Colts also announced they signed defensive end Ryan Delaire. The 26-year-old played 16 games for the Carolina Panthers over the 2015-2016 seasons, compiling 14 tackles and 3.5 sacks. He was waived last offseason with a failed physical designation and did not play in 2017 while recovering from a knee injury. --The national anthem protest by Miami's Kenny Stills and Albert Wilson, both of whom kneeled before the Dolphins' preseason opener on Thursday, is causing an uproar by police unions in South Florida. "The Broward County PBA recently offered our members discounts to a Miami Dolphins game because that franchise said they were going to honor all First Responders," the Broward County Police Benevolent Association said on Facebook on Friday. "We entered into this partnership with the understanding that the Dolphins organization would require their players to stand for the National Anthem. This did not happen at last night's preseason game against Tampa Bay. --New York Jets quarterbacks Teddy Bridgewater and rookie Sam Darnold, listed as the backups to starter Josh McCown, each performed admirably in the preseason opener -- a 17-0 victory over the visiting Atlanta Falcons on Friday night. Jets coach Todd Bowles did not want to make too much of one preseason matchup, but he acknowledged after the game that the outstanding play of his quarterbacks poses a dilemma. "We'll see how the preseason goes," said Bowles of the competition for the No. 1 job at QB, per the New York Daily News. "I'm not going to jump to any conclusions after one game. I'll take my notes and watch practice and compare with the coaches and we'll come up with a decision. But it's a tough decision. "We have three good players. And we're happy to have them." There has been plenty of hype surrounding Darnold since the Jets traded up three spots in the 2018 NFL Draft to select the former USC standout with the No. 3 overall pick. Darnold did nothing to douse the lofty expectations in his NFL debut, finishing 13 of 18 for 96 yards and a touchdown -- a 14-yard connection to Charles Johnson in the final minute of the first half. Bridgewater, seeing his first extended playing time since suffering a torn ACL and dislocated knee in the 2016 preseason, completed 7 of 8 passes for 85 yards and a touchdown. Amid reports that New York would be willing to trade Bridgewater under the right circumstances, he did not seem to be affected by the knee, throwing a 16-yard TD pass to running back Isaiah Crowell and completing passes of 23 and 21 yards. McCown, whose 2017 season was ended by a broken hand, played one series to start the game, going three-and-out. --The Jacksonville Jaguars removed defensive end Dante Fowler off the physically unable to perform list. Fowler, who has been sidelined because of a shoulder injury, practiced Saturday, the team announced. Fowler, a former No. 3 overall draft pick in the 2015 NFL Draft out of the University of Florida, was sidelined for the team's offseason program due to the injury. Fowler appeared in all 16 games as a situational pass rusher in 2017, registering 8.0 sacks, two forced fumbles and three fumble recoveries. The 6-foot-3, 255-pound Fowler had 4.0 sacks in 2016 after missing his entire rookie campaign due to a torn ACL sustained in minicamp. The 24-year-old Fowler already had been suspended for the first game of the regular season without pay for violating the NFL's Personal Conduct Policy. He was punished for punching a man following a verbal confrontation in a St. Petersburg, Fla., parking lot. --In an effort to upgrade their running game that has ranked last in the NFL in two of the last three years, the Detroit Lions signed well-traveled running back LeGarrette Blount in free agency and traded up in the second round of this year's draft to select Kerryon Johnson of Auburn. Johnson finally got a chance to show the Lions what he could do in the team's preseason opener against the Oakland Raiders on Friday and opened some eyes by rushing for a team-high 34 yards on seven carries. The numbers would have been a lot more impressive, but Johnson also had a 57-yard run called back because of a penalty. Johnson put up huge numbers at Auburn last year, leading the SEC in rushing with 1,391 yards and scoring 18 touchdowns despite missing two games. The 5-foot-11, 213-pounder is being counted on to bolster a rushing attack that averaged a paltry 76.3 yards last season -- by far the worst in the NFL. Johnson also displayed his versatility by adding four receptions for 33 yards, including a 19-yard gain on a screen pass. "It just re-ensures me that it's football at the end of the day," Johnson told reporters. "It's a different level. Of course, people are better. Of course, it's the NFL. But at the end of the day, it's a game. It comes down to running, tackling and blocking, and it's the same old game it always has been, the same old game it's going to keep being." --The New Orleans Saints released cornerback De'Vante Harris, multiple media outlets reported. Harris spent the past two seasons with New Orleans after signing with the Saints in 2016 as an undrafted free agent out of Texas A&M. The decision to waive Harris came two days after New Orleans' 24-20 victory over Jacksonville in its preseason opener. Harris drew two penalties in pass coverage against the Jaguars, according to the Times-Picayune. The 5-foot-11, 190-pound Harris appeared in 21 games over the past two years, making one start in each season. He had 15 tackles and two passes defensed in 2017. --Dallas Cowboys offensive lineman Marcus Martin is facing surgery on his big toes, ESPN reported. Martin suffered a torn ligament in the toe during Dallas' preseason opener against the San Francisco 49ers on Thursday night. According to ESPN, Martin's injury is similar to one sustained by Cowboys right tackle La'el Collins in 2016. Collins wound up missing the final 13 games of the season. Martin, a third-round pick in the 2014 draft out of USC, played his first three seasons with the San Francisco 49ers, who waived him in March 2017. The 24-year-old was claimed by the Cleveland Browns, but did not play last season. --Buffalo Bills rookie quarterback Josh Allen had a promising first preseason game Thursday after taking reps with the first-team unit in practice. Allen, the first-round pick (No. 7 overall) from Wyoming, began taking snaps with the starters a week before the Bills' 28-23 loss to the Carolina Panthers on Thursday. He entered training camp as the third-string quarterback. Buffalo coach Sean McDermott has confirmed that Allen and the team's other two quarterbacks -- AJ McCarron and Nathan Peterman -- will rotate regularly with the first-team unit for the foreseeable future. "I'm here to be the best quarterback I can be," Allen told the NFL Network. "I'm not going to worry about anybody else. I'm going to take things from Nate and AJ and learn." [post_ads]Allen led the third-team offense on five possessions against Carolina, beginning with a three-and-out and ending with a 14-yard touchdown pass to Ray-Ray McCloud. --Washington coach Jay Gruden commented that the Redskins will not sign a free agent running back to make up for the absence of rookie Derrius Guice, who suffered a torn ACL in the preseason game against the New England Patriots on Thursday night. Guice, a second-round draft pick out of LSU, was officially placed on injured reserve Saturday. "We're OK. He was sixth string on the depth chart," Gruden said Saturday in jest about the Redskins' initial preseason depth chart. "We have guys here that can play. We drafted Derrius because he was the best player we thought at the time of the draft, and we thought he could really help our football team, not because we weren't satisfied with the backs we have. "We thought he'd be a heck of a player for us. With Rob (Kelley) and Samajie (Perine) and what Byron (Marshall) did the other night, the flashes he showed, and obviously Chris Thompson, Kapri Bibbs had a couple big hits. I think we're pretty good at the running back spot." Following Guice's injury there was speculation the Redskins might entertain bringing in a veteran such as Adrian Peterson, Jamaal Charles or former Redskin Alfred Morris -- all who are eligible free agents. Thompson projects as the multi-dimensional passing-down back for Gruden. With Guice out, Kelley and Perine will battle for early-down snaps. The Redskins also have Marshall, Bibbs and undrafted rookie Martez Carter on the depth chart.